"I don't know about y'all," Tamar Braxton announced to the near capacity crowd and Irving Toyota Music Factory on Saturday night, "but I had to take my life back! How y'all doin' Dallas?" 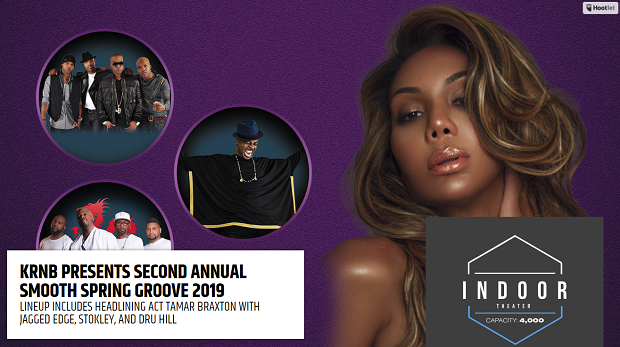 As headliner of KRNB 2nd Annual Smooth Spring Groove, singer songwriter and reality show star Tamar Braxton was certainly the crowd-pleaser, thanks to her powerful voice, life lessons and propensity to bring enough tongue popping and neck-rolling drama to overtake Broadway. In-between the music ("Hot Sugar," "The One," "All The Way Home"), Tamar openly delved into her relationship struggles, describing herself as becoming lost in who she thought she had to be as Vince's wife and warning other women not to do the same, even singing Karyn White hit "Superwoman" to elaborate on her point of quote on "how we women be doing too much." Thanks to her trademark over-the-top mannerisms, including an onstage make-up re-touch and a wig toss, the audience and her die-hard "Ta-Martians" gave nothing but love, even as half a dozen of them were marched off the stage for not singing the "the Ta-Martian national anthem," "Love and War," quite to her liking. Opening with an acapella verse from Queen's "Bohemian Rhapsody," new Dru Hill proved their vocals and their showmanship to be just as spry as their early years: despite their tendency to sing only the verse and chorus of their most popular singles ("Tell Me," "Five Steps," "These Are The Times," "Beauty," "In My Bed"), Nokio, Jazz, Anthony and the ever-blond Cisqo were as animated and charismatic as ever, even though he dubiously proclaimed that it wasn't his custom to sing solo songs during a Dru Hill show, but still proceeded to perform "Thong Song" an "Incomplete" anyway (!). Nevertheless, both Dru and "The Dragon" moved the crowd. Jagged Edge didn't have the physicality or the vocal stamina of Dru Hill, but they still put on an enthusiastic show for fans, including their best-known and biggest hits such as "Gotta Be," "Let's Get Married," "Please" and Walked Out Of Heaven": after telling "the black folks in here" not sit down as they shared their latest single, "Closest Thing To Perfect ("Y'all know how y'all act when it's a song you don't know!") and frequently thank their fans for "riding with us for the last 20 years." It was a surprise to many that despite his status as an industry vet, Mint Condition frontman and instrumentalist Stokley was in the opening slot. Warmly received and displaying elastic moves with vocals that could shame most of his younger peers, Stokley told the crowd he "stood on the shoulders of many" and paid tribute to a pair of legends, Rick James and The Time via spirited renderings of "You and I" and "Cool," respectively. Mint Condition fans also got satisfaction, thanks to "You Send Me Swingin'" and "Breakin' My Heart (Pretty Brown Eyes)," which illuminated the odd lack of emphasis on his 2017 solo debut, "Introducing Stokley": Beyond his performance of his lead single "Level," even the popular chart hit, "Organic," strangely went unheard.